LAWRENCE A. 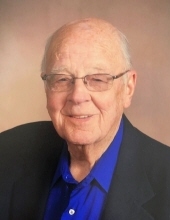 “LARRY” SIKKEMA, 90, of Fulton, IL, died Tuesday, March 26, 2019 at Harbor Crest Nursing Home in Fulton. Cremation rites have been accorded. A memorial service will be held at 10:30 A.M. Friday March, 29th at the Fulton Chapel of the Bosma-Renkes Funeral Home, with Rev. John Byker officiating. There will be a memorial visitation from 4:00 – 7:00 P.M. on Thursday, March 28th at the funeral home. Interment will be in Fulton Township Cemetery. Memorials to Second Reformed Church in Fulton and Unity Christian School have been established. Larry was born on January 25, 1929, in Morrison, IL, to Ralph and Grace (Tenboer) Sikkema. He was educated in the Fulton Christian Grade School and was a graduate of Fulton High School. Larry was united in marriage to Elaine R. Balk on May 5, 1950, in Fulton. She died on January 22, 2013. He worked at the Ice Cooling Company in Morrison for several years, and then as an insurance agent for Prudential in Sterling, IL. Then for several years he worked at Volckmann Furniture Manufacturing in Morrison and later at Don Norbury Chevrolet Olds in Morrison. In the 1960’s Larry and his brother, Art, owned and operated Sikkema Lumber in Fulton. Larry then expanded and he and his wife, Elaine, owned and operated Sikkema Furniture, TV, Appliance and Floor Covering. He also owned a Steamex Carpet Cleaning franchise. After retirement Larry was a realtor. He was a member of Second Reformed Church in Fulton, where he served as a deacon. Larry and Elaine were named as Grand Marshals of the 2003 Dutch Days Parade. He served on the Whiteside County Board for 23 years and also served on the Whiteside County Board of Revenue for 26 years. Larry was a member and past president of the Fulton School Board, and for several years he was the treasurer of the Dike Beautification Community. Larry enjoyed playing golf. Survivors include one son, Doug (Alice) Sikkema of Chattanooga, TN; three grandchildren, Jordan (Summer) Sikkema, Taryn (Ryan) Ball and Kendra (Mark) Kidwell; four great grandchildren, Addison Sikkema, Matalynn and Molly Ball, and Annie Kidwell. He was preceded in death by his wife and one brother, Art Sikkema. To send flowers or a remembrance gift to the family of Lawrence A. "Larry" Sikkema, please visit our Tribute Store. "Email Address" would like to share the life celebration of Lawrence A. "Larry" Sikkema. Click on the "link" to go to share a favorite memory or leave a condolence message for the family.